← I Hit the Goal! 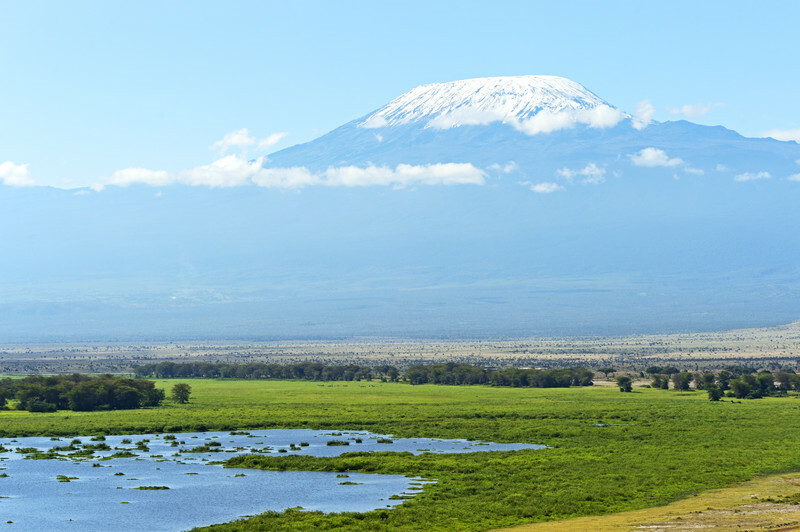 My goal was to survive my encounter with Kilimanjaro, not conquer it. I was in Moshi, Tanzania where I met my guide. I was ready. I was nervous. And I was alone. Frankly, I wasn’t quite sure what I was doing here as this trek was not a life long dream of mine, but, I was in good shape and I was competitive. My previous research had me going up the “coca-cola” trail, also known as the Marangu Route, because it was known to be the easiest. It is generally considered undemanding for children who drink sodas — unlike the “whiskey” trail for the certified climbers who can handle the ruggedness! If all went well I would reach the summit on the morning of my 58th birthday. The drama of that was important to me. As I disembarked at the Park Entrance I was introduced to my “team”: Eugene, my guide; Julius who would serve me food and provide a bowl of warm water for washing twice a day; George, the porter who carried the week’s food for the team; and Johnson, the cook. Day one was a relatively easy hike, only 3 hours and a high of 9022 feet. There were huts placed at three strategic intervals along the trail, allowing a protected sleeping area for hikers, guides and porters. That night taught me about coldness, midnight hikes to the toilet and the lack of privacy. The next day we trekked a good five hours which brought us at least 5600 feet higher. I began to feel the effects of high altitude. A dull headache became my constant companion. It was getting considerably colder. I was aware of my lungs, and I worried about altitude sickness. Experiences and knowledge were handed out freely by other hikers and I learned more with every question I asked. I had no desire to take diamox but I didn’t want to succumb to altitude sickness. As it was, the malaria pills were messing with my stomach. I was worried about how little water I managed to drink and was concerned that my appetite was diminishing. After listening to advice, some conflicting, I decided if I suffered from high altitude, rather than take anything, I would just call it quits and go down. We had climbed to about 15,500 feet at that point, at least 1000 feet higher than I had ever ascended before. Rather than quitting for a respite, Eugene, my guide hit me with another option:he had heard of another climber completing the trip successfully on this fourth day and he thought I was strong enough to do it too. Nevermind that the majority of hikers do not do this for a REASON. Supposedly it was easier to climb the “scree” (lots of nothing but gravel that moves) during the wee hours of the morning when it was still frozen, and this plan also allowed the climbers the chance to view the sunrise from the top of Africa. Oh well, why make it easy? Eugene gave me thirty minutes to change into my warmest layers, eat a quick lunch and meet him at the onset of the final charge! The plan called for five additional hours to reach Gilman’s Point and then another hour and a half to get to Uhuru Peak. Unfortunately for me I hadn’t even remembered to bring Tylenol. My head was hurting, my breathing was labored and I was extremely bored with the continued slow digging in of each heavily booted foot. I struggled with the internal demons that were trying to convince me to quit! After three hours of the grueling drudgery of baby steps, slight slipping, breathing dust from the unsettling of these grisly grey impediments I was cussing the mountain. I couldn’t believe that no one had told me how horrible it was; loose rocks, loose rocks, and more of the same over and over again. I was positive we were not making any progress whatsoever. Struggling for close to five hours found me atop of some big boulders. My thighs winced in pain. I was totally unaware of the cold until I pulled off one of my mittens to locate my camera. After a few moments we were standing on top of Kilimanjaro. 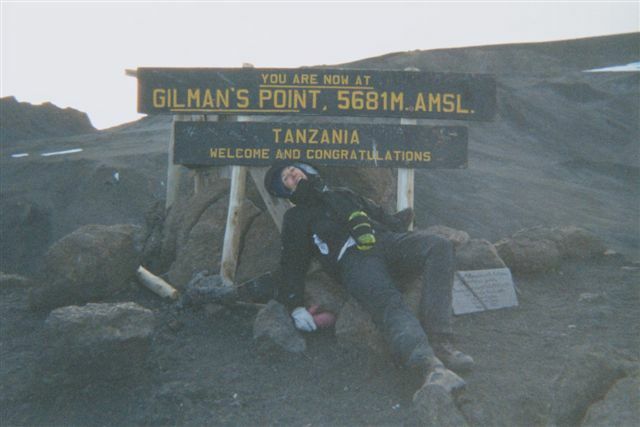 There was a sign telling me I had reached the summit of Gilman’s Point (18,645 ft). The healing of the moment was amazing. All the pain dissipated; I could breathe and smile simultaneously, and my legs were still under me. I asked the way to the other peak and said I was ready to go. Eugene strongly suggested that time was no longer on our side and perhaps we really needed to go down. He took my picture and we turned back down the way we came up. Martha Stewart had climbed higher than I did. Not only that, she probably did more than just throw her sleeping bag on the mat, she probably had mineral water, brie and Belgian chocolate in her backpack. All my pains revisited with renewed force. Defeat weighed heavily on my lungs, stomach and legs. I wanted to sit down, rest and cry but the night was beginning to envelop us. The moon was almost full, I was still 57 and I was miserably depressed. My competitive spirit took me on a great adventure but came up short of my expectations. It was a lonely trip down. On the way, I passed four young strangers who wished me a happy birthday. They had heard about my quest from one of my many new friends I had met. I was beginning to feel better. It was a long hard day but by 3PM I collected my certificate from the park personnel. Leaving the park, I requested that instead of the prepaid hotel I had booked, could I please go to a place that accepted credit cards, had no mosquitoes, furnished a hairdryer, and featured wine on the menu? 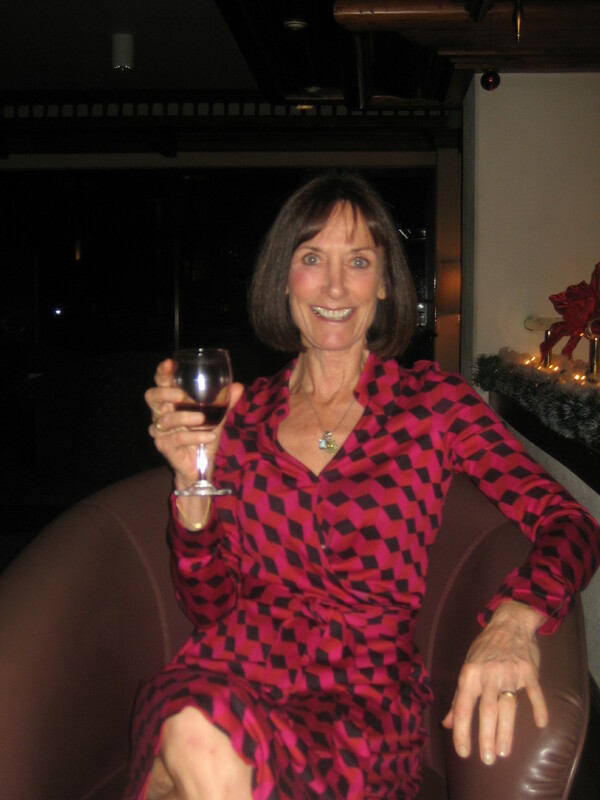 This entry was posted in Aging Adventurer, coca cola route, Kilimanjaro, martha stewart, top of Africa, travel and tagged altitude sickness, Kilimanjaro, Martha Stewart, roughing it. Bookmark the permalink.